A successful petition has the right goals, is written for the best audience, and has a strong message that resonates. Let’s dive headfirst into how to craft that powerful message to start your petition. Write a short headline that grabs attention and creates an immediate connection. Write a summary that either demands or requests change and tells people why they should sign. Keep your petition short (150–200 words), and include paragraph breaks and bulleted lists to make it easy to read. Demand change, or request change? Stop / Start / NOW! 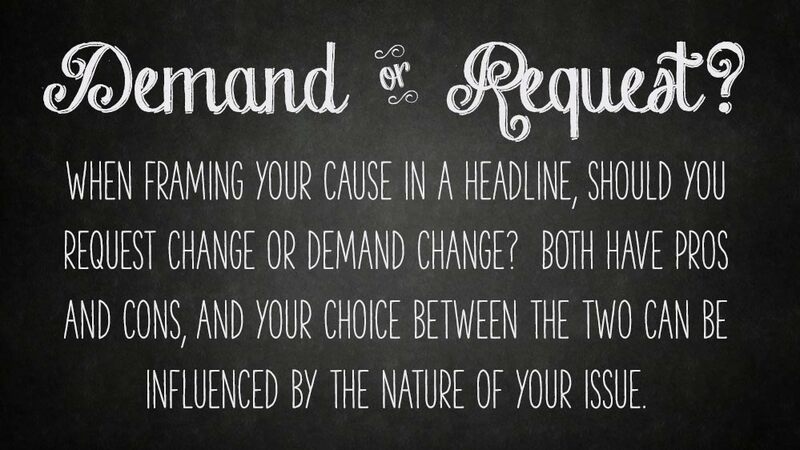 A headline is crucial to grabbing attention and creating an immediate emotional connection to your cause. It grabs readers’ attention and draws them in to learn more. Keep your headline short — four to ten words is best. Step 2: Demand or Request? When framing your cause in a headline, should you request change or demand change? Both have pros and cons, and your choice between the two can be influenced by the nature of your issue. Demand change: Petitioning a government or company to correct human rights abuses would fall under this category. It is urgent. Focusing negative attention on the perpetrator can help you get more attention. Request change: If you are petitioning a park to stop the sale of bottled water, you’ll be more likely to be taken seriously when you demonstrate a willingness to work with the target in a measured way rather than try to force their hand. Step 3: Positive or Negative? Your tone sets expectations and can influence your supporters. Are we building up or tearing down? 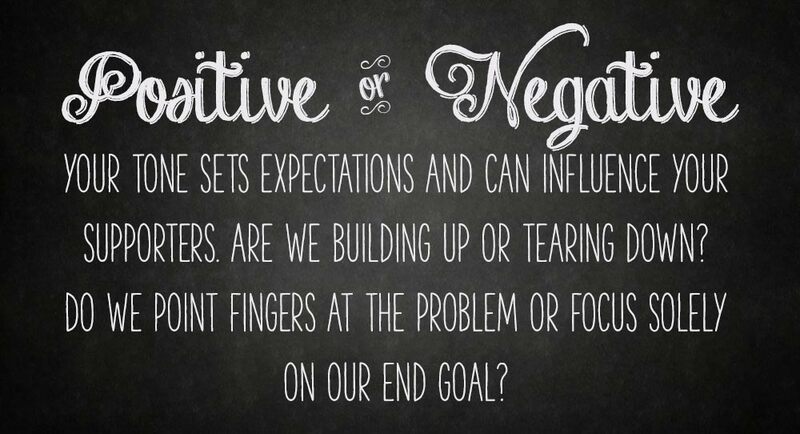 Do we point fingers at the problem or focus solely on our end goal? There is no right answer here, as both can yield overall positive results. Just be consistent! Keep your message forward-thinking. Negative campaigns can still focus on a positive resolution. Remember, we want our target to take action in our favor. If we cross the line and sling too much mud, they are likely to sling back! The goal of any petition is to engage a dialogue with our target. If you were the target, how would you like to be spoken to about this issue? Make contact with your target ahead of time! Raising your concerns directly with your target can be a springboard for creating change. Perhaps they are willing to change course without any extra attention brought to the issue. Always, always, always stick to the truth. A lie or exaggeration can derail an otherwise successful campaign. Step 4: Stop, Start, Now! Using these three words can immediately focus the attention of both your target and your supporters on the task at hand. STOP: What action needs to be halted? START: What can we do instead? NOW: What benefits can be achieved, immediately or imminently, by changing course? Urge your petition supporters to not only sign and share, but take a small and measurable action to propel the issue forward. Your petition should include ways to support the cause in addition to signing and sharing the petition within their circle of influence. In future posts, we’ll talk about what some of these actions might be. Add photos and videos for the strongest impact possible! Compelling media brings your issue to life — adding pictures and video adds a tremendous boost to your petition. Images should be clear, have an obvious focal point and tell a story consistent with your campaign. In photos, use images of individuals rather than groups to create a more personal connection between the viewer and the cause. The emotional response should match the overall positive or negative tone you’ve set for the petition. The ideal image communicates your campaign’s main idea clearly, without the need for additional explanation. Don’t just limit yourself to photos and videos! Creative ideas like graphics and diagrams can be utilized in many ways. Step 6: Promote, Update, Repeat! Promoting your petition doesn’t stop as soon as it goes live on Care2 Petitions — far from it! Sharing your petition repeatedly via different social media channels gives your family and friends multiple opportunities to learn about your issue. After you publish your petition, continue talking to the target! Let them know there are others who support your cause. Likewise, keep your petition signers updated on new developments. When the target sees a groundswell of support rising, they may institute changes in your cause’s favor before the petition has even been completed. Fortunately, online petitions easily and quickly allow you to communicate changes and developments. It’s very easy to create a petition using Care2 Petitions. We prompt you each step of the way, from creating amazing headlines to easily sharing your created petition in the quickest and easiest ways possible. Now, continue on to part five of our series, where we provide detailed advice to make the most of your live petition.